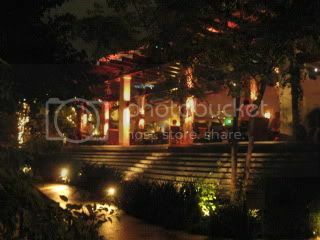 I got together with girlfriends for dinner at The Restaurant, which is in Sunset Marquis Hotel. Once you enter the hotel, you would forget you are right off busy Sunset Strip. This hotel gives such a nice private feeling. And the restaurant is so beautiful. There were 4 of us tonight for a birthday celebration for myself and another girlfriend. It was so sweet of them to plan this dinner. 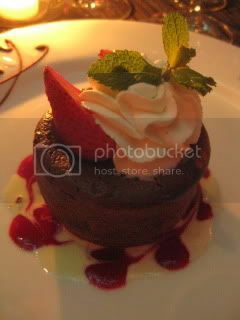 The executive chef of The Restaurant is French and he has worked in Japan also, so the menu is modern European with some Asian twist. 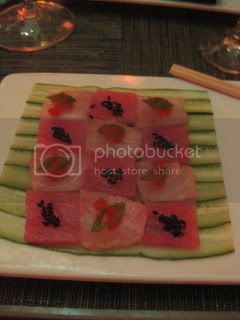 My appetizer was Blue fin tuna & hamachi sashimi chessboard. It was very pretty! 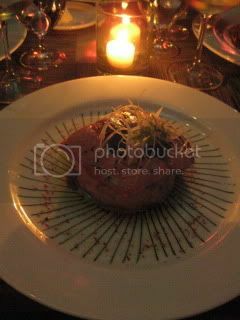 Main course...Wild-caught sockeye salmon over porchini mushroom and abalone risotto. 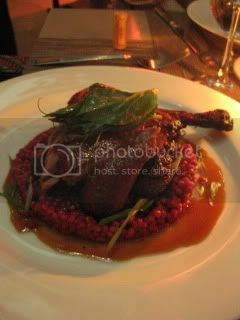 My friend's Peking-style duck breast looked very nice, too. 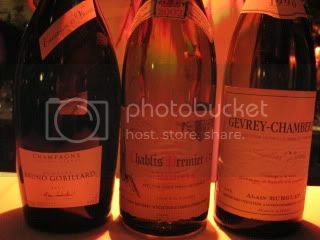 We enjoyed nice wine parings...1990 Alain Bourguet, Gevrey-Chambertin VV started open up after 20 minutes and it was so lively and elegant.